This puts him in the company of drivers like Nigel Mansell and Mika Hakkinen who had to wait a long time to get a car capable of winning a race. But they both went on to become World Champions, so why shouldn't Bottas? He has always been fast but not the complete article and he has had odd mistakes as a feature of his game; he hit the wall on his F1 debut in Australia and in his second race with Mercedes this year in China he spun behind the Safety Car which took him out of contention. Here he made a mistake in the second half of the race that could have cost him the win, when he locked up and flat spotted his left front tyre, but he got away with it and Sebastian Vettel could not catch him before the end. 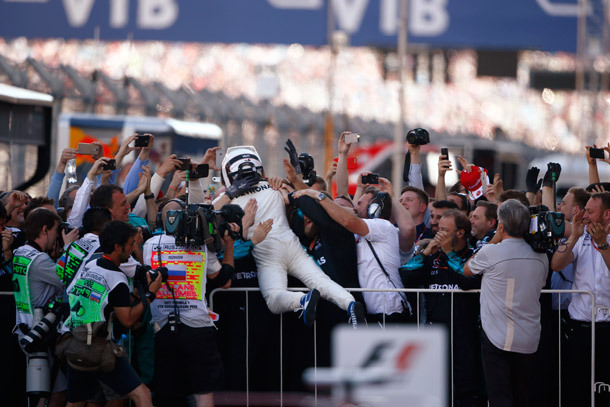 He will only get better and more consistent now that he has the monkey off his back and his first F1 win. It was quite a dull race, with no significant overtakes to speak of. However there was some interest in the battle between the Renault of Nico Hulkenberg and the two Force India cars of Sergio Perez and Esteban Ocon. They started behind the Renault on the grid but got ahead at the start. To try to recover, Hulkenberg went for a long stint on the ultrasoft tyre before making a pit stop. But because the tyre degradation was so low in Sochi, it didn't work, even though his tyres were so much fresher in the closing stages than Perez and Ocon's. 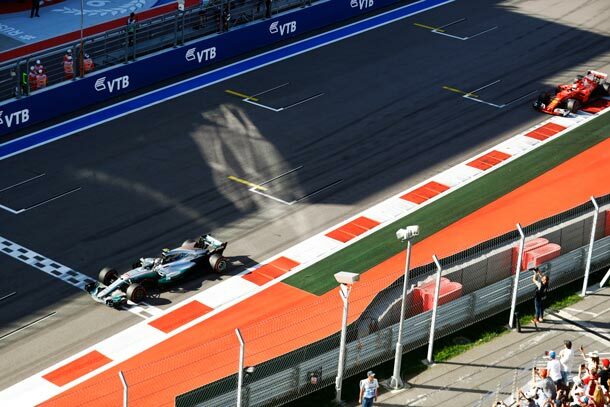 He ended up finishing where he started, despite the fact that two cars ahead of him on the grid hit trouble; Ricciardo retired and Massa fell behind him due to a puncture. In a race where overtaking is extremely difficult and the tyres are so hard they will do the race in one stop, you cannot afford to lose two places at the start. Eleventh is an awful place to finish a Grand Prix, especially if you have yet to score your first world championship points to settle the nerves. That is the situation for Lance Stroll, who has still not got off the mark in F1 despite driving a Williams. Stroll's race was looking promising after the start, when he jumped up from 11th to 9th place, ahead of Ocon, Hulkenberg and Magnussen. But he then spun when the Safety Car came out and dropped to 15th. Although his race pace in the second stint matched his team mate Massa's much of the time, he could not make up the places lost and a prime opportunity for points went begging. Top level sport is always about the details and executing perfectly; mistakes like spinning when you've had such a great start. Spain should present a good chance as he knows it well from testing and the Williams is very fast there. Monaco will be a challenge and that's the last chance before he travels to his home race in Montreal. He will not want to arrive there with no points in F1, as the questions from local media about a lack of results will really get on his nerves.